Denholme United opened their Halifax AFL Premier Division campaign with a 3-0 home win over the other promoted side, Copley United, last night. Last season’s runaway Division One champions had goals from Ben Burkill, Michael Midgley and Matthew Waring at Foster Park against opponents who had beaten Shelf United 2-1 on Friday. Brighouse Sports were 3-0 winners in their Division One derby against Sun Inn Rastrick with Gary Binns, Connor Durkin and Harrison Hines on target at Carr Green. There were five matches in Division Two - very much a rarity on a Wednesday evening at the start of the season - and Greetland Reserves made it two wins out of two with a 3-2 success away to Midgley Reserves. Nathan Sloane bagged four goals and Phil Livesey two in Illingworth SM Reserves’ 7-2 success over Northowram Reserves at Trinity Academy. Sowerby Bridge Reserves were similarly handsome winners in a 5-0 success away to Stainland United. 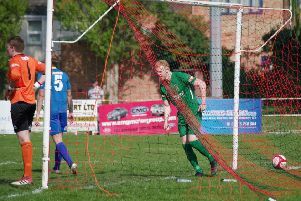 Ben Hiley, Dan McStraffick, Joe Ashington, Ste Enright and John Wilkinson were their scorers with Enright’s 30-yard lob over the home keeper the pick of them. AFC Crossley’s made a winning start with a 6-3 success over Shelf United Reserves at Lightcliffe Academy. Ross Broadley’s hat-trick for Shelf, after coming off the bench, was in vain. Sowerby United Reserves beat visitors Calder ‘76 Reserves 2-0. They got a goal in each half at Ryburn Valley High School with Ryan Allen and Hayden Bruce their marksmen. Elland United won by 7-0 for the second game running in Division Three. Mark Kelsey scored five times before being substituted with 25 minutes left away to Hebden Royd Red Star Reserves. Vaughan Boon and replacement Jake Bradbury were the other scorers at White Lee Rec, Mytholmroyd. Results - Premier Division: Denholme United 3 Copley United 0. Division One: Sun Inn Rastrick 0 Brighouse Sports 3. Division Two: Illingworth St Mary’s Res 7 Northowram Res 2, Midgley United Res 2 Greetland Res 3, Shelf United Res 3 AFC Crossley’s 6, Sowerby United Res 2 Calder 76 Res 0, Stainland United 0 Sowerby Bridge Res 5. Division Three: Hebden Royd Red Star Res 0 Elland United 7. Ryburn United beat Ovenden West Riding for the second time in eight days in the West Riding County Amateur League last night. They followed up a 4-1 away win with a 4-0 success at Ripponden Wood to climb to third in the table with four wins from six outings. Ash Skully threatened occasionally for the visitors but two second half goals from Lewis Brierley took the home side clear.